Queta believes that our differences make us stronger. A deep resonance with family, community, learning, service and compassion underpin both her life and work. Her commitment to social, environmental and economic justice began in her youth and has been growing and evolving since. Queta feels privileged to have worked internationally on development and implementation of diversity teamwork strategies. A seasoned professional, she has been training, facilitating and coaching people in Fortune 500 companies, non-profit organizations, government, and small businesses for over twenty years. She has developed and delivered trainings across a myriad of cultures and worked in partnership with a variety of organizations. She is the Programs Director for the Portland-based Center for Diversity & the Environment (CDE), where her work includes design and delivery of strategic engagement sessions, organizational trainings, facilitation of both the Environment 2042 cohort and Exploring Power, Privilege and Tools for Change retreats, design and coordination of Equity Audits, leadership coaching and organizational consulting. She is an adventurer who follows her passions. Her experiences run wide and deep, amounting to a litany of professional roles: assistant curator of an invertebrate museum; experiential and wilderness-based educator; recreation planner; advocate and educator with at-risk youth; gang rescue team; adolescent health care advocate and educator; food security advocate; champion of early childhood education; trainer; as well serving in numerous team and organizational leadership roles. 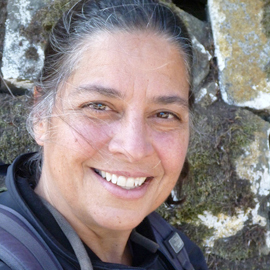 Two common threads connecting her diverse experiences revolve around systems of community and ecology. Her life and work have thus been characterized by the advancement of diverse, inclusive and equitable environments and a deep connection to rivers, land and wilderness. Queta’s mother has had a great influence on her life, which has led her to regular volunteerism (and weekly chores) since elementary school. She currently serves on Verde’s Community Outreach Advisory Committee, Multnomah County’s Advisory Committee on Sustainability and Innovation, and the Community Cycling Center’s Board of Directors. She also participates in additional episodic volunteer activities. She is eternally grateful for and enriched by supportive and loving family and friends and lives in Portland with her amazing partner.